Mohandas Karamchand Gandhi was born in Porbandar, a coastal town in present-day Gujarat, India, on 2 October 1869. His father, Karamchand Gandhi (1822-1885), who belonged to the Hindu Modh community, was the diwan (Prime Minister) of the eponymous Porbander state, a small princely state in the Kathiawar Agency of British India. His mother, Putlibai, who came from the Hindu Pranami Vaishnava community, was Karamchand's fourth wife, the first three wives having apparently died in childbirth. 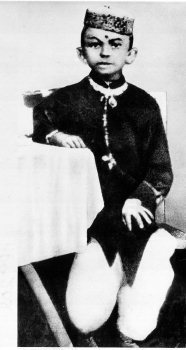 Growing up with a devout mother and the Jain traditions of the region, the young Mohandas absorbed early the influences that would play an important role in his adult life; these included compassion to sentient beings, vegetarianism, fasting for self-purification, and mutual tolerance between individuals of different creeds.